Hello hello! How often do you go on Pinterest or other blogs and see TONS of kids activities for toddlers and young kids? I have nothing at all against them and truthfully, I’ll be seeking their advice in a couple years. On the flip side, I often see articles like “Top 10 Amusement Parks to Visit this Summer.” However, I currently have a 9 year old stepdaughter who needs a bit more stimulation than a 3 year old, but is not quite a thrill seeker. Now don’t get me wrong, there are PLENTY of adventurous 9 year olds. I just don’t have one at the moment. As a result, here is a round up of 10 suggestions for our kind of kids activities. Disclaimer: Any direct links are to kids activities in or around Queens, NY. However, please look for similar options by Googling in your area! Costs vary, so if they are not noted, please visit the linked websites to see more information. 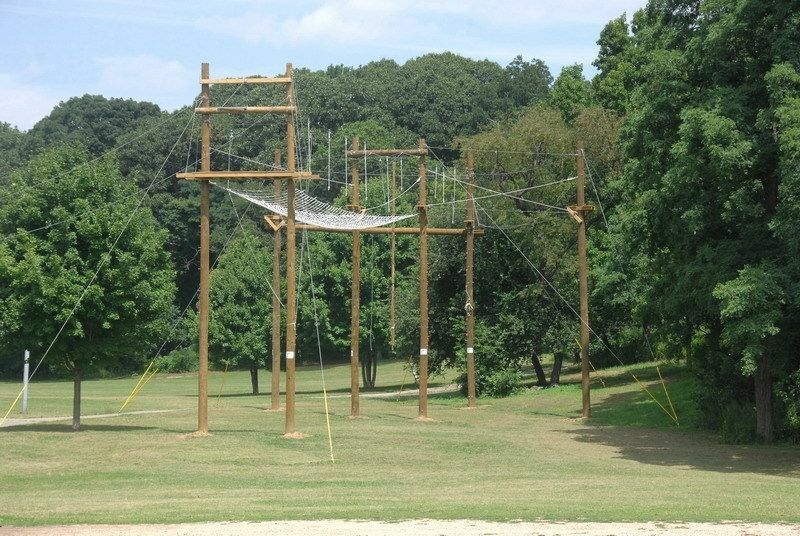 A personal favorite of mine is the outdoor adventure course, otherwise known as high ropes course or treetop course. This one in particular is Alley Pond Park Adventure Course located in Alley Pond Park in Queens, NY. They have two sessions per Sunday at 9:30 am and 1:00 pm. The reason behind this feature is that they offer public programs on Sundays for FREE. You read that right. Normally, adventure courses, such as the Bronx Zoo Treetop Adventure or The Adventure Park at Long Island, can easily cost your family upwards of $150 for two kids and a parent, but the one at this city park is absolutely free. The one caveat is that it is super popular in the summer months and requires you to enter a lottery between June 25 and August 20 in 2018. Bonus tip: if you are a scout leader or teacher looking for kids activities, this would be a great team and skill building choice! There is a fee for these types of groups of $500 for up to 30 participants. It works out to just under $17 per person, which is still within reasonable range. Trampoline parks are another one of my personal favorites. I am a kid at heart after all! I have been to super casual semi-covered outdoor trampoline parks, where it was something like 6 by 8 trampolines built into the ground. Thinking back, I have no idea why my parents let my sister and I do that. I have also been to places like Sky Zone (not the linked one in particular, but the same chain), which are state of the art with professional trampolines, tons of foam blocks, and even a launch pad if you’re daring. My stepdaughter (and I) had a blast! We paid some amount for like 2 hours and just wore ourselves out jumping and doing somersaults. This was a bonus because she has so much energy and we need to engage in these types of activities to get through the day. By the way, if you do go with your kids and are not in shape, be prepared for quite the unexpected workout! Indoor rock climbing typically consists of bouldering, top roping, and lead climbing. I will soon be making a Rock Climbing for Dummies post (not that you’re a dummy!) as it was one of my hobby obsessions for about 2 months before I developed an overuse injury at work. A few places I frequented in the area include Island Rock and The Gravity Vault. I’ll go more in depth when I write my rock climbing post (and eventually come back here to link it). It’s a fun way to workout both you body (muscles you never knew you had) and your mind! The rock holds are typically one color that is set in a route that you have to maneuver to reach the top. If your little is a climber this is one of the natural kids activities to get them into. Fair warning, if they fall in love with climbing, this sport can easily get pricey. That said, I wholeheartedly recommend it and hope to return one day–maybe even get in some outdoor rock climbing. Located at the home of the World’s Faire, the NY Hall of Science is a great hands on museum that will easily please kids and adults of all ages. Almost every exhibit is hands on, allowing kids to learn about the science present in their everyday lives. Some kids activities include building with PVC pipes, taking a swing to measure their batting speed, and feeling what it’s like to ride some waves on a surfboard. There’s tons to do that will keep them busy for hours. The NY Hall of Science is easily accessible via the 7 train, has it’s own parking lot ($10/car), and has free hours every Friday (2-5 pm) and Sunday (10-11 am). Their regular prices aren’t bad at $16 per adult and $13 per child (2-17 years old). For additional fees, you can also make use of their Science Playground, Rocket Mini Golf, or 3D Theater. Finally, the NY Hall of Science is part of the Association of Science-Technology Centers, meaning your membership might qualify you for reciprocal membership at 300 other facilities and vice versa. If you have a membership, definitely take advantage of the program! Not quite in NY, but just across the river is another amazing science museum, the Liberty Science Center. This is a bit more of a trek from my neck of the woods in Queens, but worth it nonetheless as it’s easily a half to full day trip. So, funny story: my parents had brought me and my sister here when we were young. I was likely an “older kid” as is the theme of this post. We went into the legendary Touch Tunnel, which I must mention, I had successfully completed before! For whatever reason, this last time, I had an absolute panic attack while in the tunnel. My sister was with me and tried to keep me calm, but I was freaking out. I started going backwards, which, you can imagine, is not allowed for safety reasons. The museum has cameras inside the tunnel with someone keeping watch. They saw me freaking out and opened the emergency side exit to let me out. Talk about mortifying. I was one of the older kids in the activity and had to be saved by the museum staff! Despite my meltdown that afternoon, I highly recommend bringing your kids and letting them experience the Touch Tunnel. It’s one of the major kids activities at the museum and, clearly, there is a way out if your kids too freak out 😉 You can also wear them out on the climbing apparatus that reminds me of mushrooms. This museum is on the pricier side, starting at $22.75 per adult and $18.75 with premium options for various combinations. Parking is decent at $7/car. The National Museum of Mathematics, otherwise known as MoMath, is much newer at just around 10 years old. Now don’t get me wrong, if you tell your kids, “Guess what! We’re going to the Museum of Mathematics,” I highly doubt they will jump for joy. In fact, I would bet the response is more along the lines of, “Ugh, do we have to?” However, what they likely don’t realize is that this interactive museum allows them to play and experiment, while showing kids how math is folded into what they do everyday. At this museum, your kids can shoot a basketball via robot, ride a bike with square wheels (pictured above), and have fun learning about parabolas! Crazy, right? Tickets aren’t bad at $17 per adult and $11 per child (2-12 years old). Students are also $11, but must show a student ID. Now this museum is a bit on the smaller side, so it’s likely a half day adventure at most. However, being located in Manhattan means there is plenty nearby, such as Madison Square Park. What better kids activities than arts and crafts? Okay, maybe that’s a personal bias. Still, I think it’s great when kids get to have an outlet to make something. The Children’s Museum of the Arts gets those creative juices flowing. In addition to art exhibitions, this museum features a slew of classes and activities for the wee under 5 year olds to the hard-to-please teen crowd. They even have family activities for everyone to work together, which I think would make a great decorative piece for your home. Admission is $12 per person ages 1 to 65. If you are over 65 or visit on Thursdays from 4-6 pm, admission is pay what you wish. To segue to a different class of kids activities, I am eager to feature Home Depot Workshops, specifically the FREE kids workshops. Home Depot offers free workshops for kids aged 5-12 years old on the first Saturday of every month from 9 am to 12 pm, while supplies last. By free, I mean they include a kit for every kid, which includes the materials, as well as paint to decorate their project. Husband and I have taken his daughter twice I believe. Once was to create a Valentine’s Day mailbox and the second to create wooden flower pot holder. We would likely go more often, but we don’t tend to get his daughter for the first Saturday of any given month (or remember to do it when we do). If this program is still around in a few years, I fully intend on making good use of it. By the way, I also need to mention, they give out kid sized orange Home Depot aprons and a pin of that month’s project, which are ridiculously adorable. Truthfully, I would collect those myself if I could. On a similar vein, Michael’s features weekly (or so) classes and workshops. These workshops are generally not free, but they do try to keep costs to a minimum ($2-$5 for kids activities, more for adult workshops). Typically, you just pay for the base materials, such as a mug or piggy bank. Other times, they might as for $2 to contribute to bulk materials. These workshops run much more frequently and vary in difficultly, as well as desirability. The first week of June features slime, which I know can be a point of contention with many parents. Personally, it was great fun when I was a kid and it’s great for sensory play, so, as long as it remains contained, I’m all for it. Of course, that is purely subjective and because they have different projects, if you don’t like the project one week, you might enjoy it the next. The final feature for today’s post will be Mud Genius, located in the Bay Terrace Shopping Center. This is one of those studios where you can drop by, your kid can pick out what they want to paint. This studio in particular actually has a few different activities: pottery painting, canvas painting, candle making, and more. Pieces vary in price depending on size and complexity. This is one of those kids activities that is actually great if you have kids of varying ages as everyone can have fun painting! I particularly like Bay Terrace because they have ample free parking, a movie theater, grocery store, clothing stores, and COFFEE! Okay, yes, lots of places have coffee, but I feel as though it can be a plus for many mamas and dads out there trying to keep up with their kids! Alright folks, hope these suggestions will help guide you in finding fun and creative older kids activities this summer. With so many options, it might actually be the challenge of landing on which your family should do! When I was young, my aunt used to take my sister and I for a week while my parents got a break from us kids. She allowed us each a day that was ours to pick what we were doing as a group–the other sibling was not allowed to reject the idea. What are some ways your family gets around arguing over which kids activities you’ll be doing that day? Let me know in the comments below!